Take a look at Project Eternity, potential fantasy RPG and Kickstarter concept of the hour. At the time of writing, it has long since reached its minimum target and nears $1.8 million in funding, where stretch goals promise development of a new playable race, class, and companion. At $2 mil there’ll be a player house; at $2.2 mil, Linux support. Stretch goals beyond $2.4 mil are TBA, but momentum is such that developer Obsidian couldn’t be blamed for tentatively writing them up this afternoon. Yet in the world of groundswell publishing, not all pledges are equal. 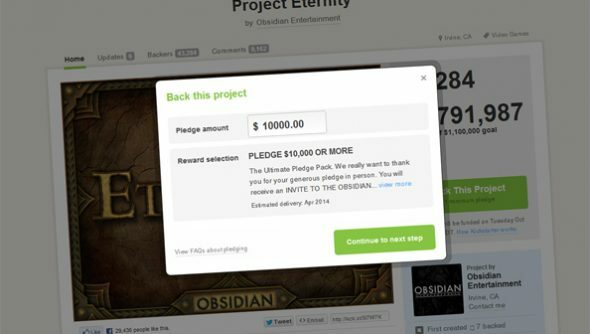 Amongst the 43,089 backers Project Eternity has amassed to date, less than 100 are responsible for 8% of the development budget. Of that near-$1.8 million total, these 93 backers have together offered $141,000 – in some cases, more than $10,000 each. There’s no publicity to be had. Unlike the similarly epochal Humble Indie Bundle, there’s no top ten contributors page. What’s more, a comprehensive Gamasutra survey reveals no evidence of nepotism – big spenders rarely know the creators of the projects they are so crucial in funding. Who are these men and women, then, who spend thousands of dollars when they could spend 30 or less? Sam Posten is a New Jersey software engineer. 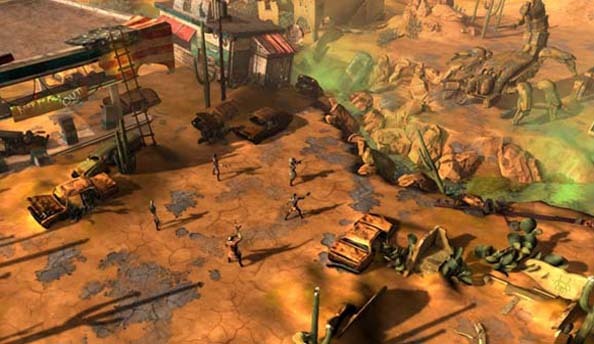 He pledged $1,000 to inXile, and in return will become an NPC in Wasteland 2. Two things, then, convinced Sam to part with so much of his cash: the reward itself, and goodwill towards the project’s team, the individuals themselves – both fuelled by nostalgia. The same two motivations convinced Steve Dengler to spend $5,000 on Project Eternity. Dengler made his fortune with online currency exchange site www.xe.com, and now uses his acquired wealth to fund game projects – most notably those of Double Fine. Without him, there would be no Psychonauts on Mac, and no Costume Quest or Stacking on PC. When we catch up with him, though, he’s been looking into the specifics of designing the Dracogen Tavern, his in-game reward for pledging to Obsidian’s project. Although Dengler is now lucky enough to know some of his favourite developers personally – as a self-described “super-fan” – his fondness for them and his willingness to fund projects still seems tied to a love of their past work. “I’ve been very fortunate with my circumstances, so when I see a project that’s being made by a studio I really like, or people I really, really like – I like Brian Fargo, I like Tim Schafer, I like Chris Avellone, I know these guys – it’s fun to be able to take those resources and give back. Dengler’s experience on the other side of campaigns – where, no matter the names attached, doubt sets in at the eve of launch – means he likes to pledge early. “It’s nice to come in at the beginning and give it a little boost, so that in the first little while that number’s moving up at a fair clip,” he says.